We have added many new exciting features and improvements to bladeRF in the past couple of weeks. By upgrading to the latest FX3 image ( http://nuand.com/fx3/latest.img ) you can now store FPGA images on the SPI flash by running `bladeRF-cli -L hostedx40.rbf`. 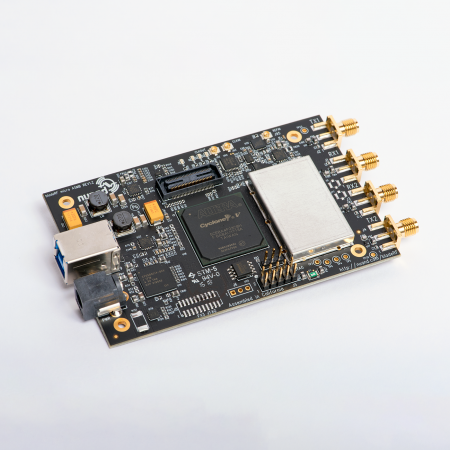 This will allow your bladeRF to read an FPGA image from flash and program the FPGA without the need of a host computer. Autoloading was used to get the UAV-SDR operational ( http://www.nuand.com/blog/heading-to-defcon/ )! Simon Brown of SDR-Radio fame has recently added bladeRF support to SDR-Radio v2.1 (which is still in beta). To download and try out SDR-Radio follow this link: http://v2.sdr-radio.com/Download.aspx . 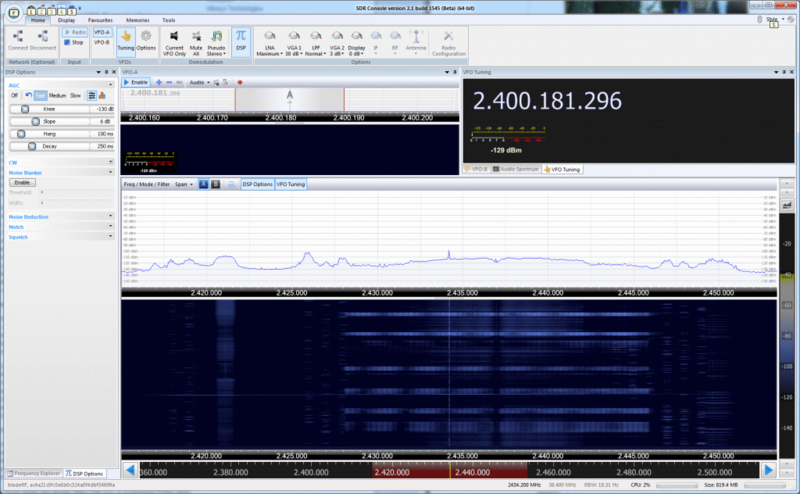 Scrolldown for a screenshot of SDR-Radio looking at 38.4MHz of bandwidth in the 2.4GHz band. A moderately active 802.11 device can be seen at 2.437GHz (which coincides perfectly 802.11 channel 6!). The narrower signals between 2.448GHz and 2.451GHz belong to Bluetooth devices. Preliminary Matlab support with included instructions can be found at http://nuand.com/downloads/matlab.tar.gz . We will update everyone as soon as a separate git repository is launched to address Matlab support for bladeRF! There is also preliminary support for bladeRF in PyBOMBS now at https://github.com/nuand/pybombs . A quick guide to using PyBOMBS can be found at http://gnuradio.org/redmine/projects/pybombs/wiki/QuickStart , please ensure you clone our git repository when following those instructions. Lastly, the HF/VHF transverter has undergone multiple architecture revisions, although they all seem to work we have felt like there might be room for a little more performance increase. We have taken into consideration many people’s requests and suggestions about the overall architecture of the transverter on IRC, the forums, and over email. We hope the proposed improvements we have come up with will be well worth the wait. We will present the semi-final block diagram and performance characteristics of the expansion board shortly.